Initially, the idea of adding flames to your Toyota Prius seemed foolhardy to us. 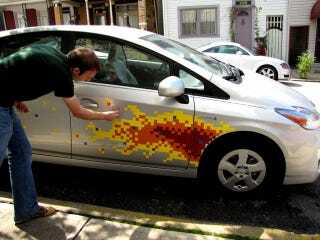 And then we saw this fine example of 8-bit flames on the side of a 2010 Toyota Prius. Fitting. How it was done below the jump. Click next to see in full detail the process of creating your very own NES-worth flames, as demonstrated by Flickr user Saeru. This was all done with colored strips of magnets cut into approximately one-inch squares using some scissors and a paper cutter. You have to chose the right car and, in our view, the Toyota Prius isn't a bad choice given its hybrid drivetrain. This could also work wonders on a Tesla. Attention to detail is important, it's probably best to have a drawing of flames to start with. It's all in the details, and little bits of blue make the fire pop! If you have some leftover you can also ornament the rest of the car.